I am standing in front of a mini-bar in the first new five-star hotel to open in Phnom Penh in 20 years, staring at a thin, single-serve packet of Nescafe. The Pellegrino, the bottle of white wine, even the Mars chocolate bar in the refrigerator—I don’t even consider these indulgences. 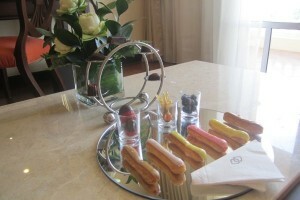 But a cup of coffee would go damn well with the welcome spread of house-made mini-eclairs and Belgian chocolates sitting on the marble coffee table of my Superior room. I pull out the water heater and open the packet with apprehension. I think back to the last Western hotel I stayed in: a Super 8 in Austin, Texas. Nescafe was free there. But then again, so was the Wifi. Which is categorically Not Me. As two gloved doormen welcomed me into the coffered-ceilinged, crystal-chandeliered lobby, I felt the way I did as a kid at our family’s annual “fancy dinner”: awkward and giggly. In my dust-covered Toms and cleanest dress, the only other guests I saw were brisk-walking Chinese businessmen. Meanwhile, a cavalry of staff stood poised behind counters; a lovely receptionist handed me a welcome drink of lemongrass tea. I take my Nescafe and a chocolate onto the balcony. There’s no furniture, so I lean on the railing. It’s curiously quiet, the din of the motorbikes a faint whir. Swallows swoop in the late afternoon sun. I can see the familiar skyline of the city that has become my temporary home—the Royal Palace, Canadia Tower, the contour of the Bassac River. It seems far away and muted, as if I was looking at it through glass. Immediately below me, just outside the manicured green lawn and palm trees is a fenced vacant lot: “Kings Estate Luxury Villas” reads the billboard. Outside the fence, on the muddy riverside, I spy a man squatting in the shade, his food cart parked beside him. A woman has rolled up her sarong and is wading thigh-deep amid the lily pads of the river. Outside, I think, it is still the Phnom Penh I know. I look out from behind my scratched, knock-off Ray Bans. Behind the empty row of lounge chairs, behind the greenery abutting the fences, I can see a construction site on the other side of the river: another lot of private luxury villas, skeletal structures with uniform tiled roofs. Since the Khmer Rouge, Phnom Penh hasn’t had traditional rich and poor neighborhoods. When people returned to the decayed city in 1979 after nearly four years of absence, they resettled in any flat they could find. The result was a hodge-podge of a city, where, say, doctors live beside families of squatters, wealthy expats and old women selling cigarettes from their living room. Sofitel Phnom Penh is after a different demographic than its Siem Reap counterpart: businessmen, ambassadors, investors, the people who are literally changing the physical landscape of the city. Like the construction sites surrounding it, the hotel’s eight restaurants, its spas and boutiques, its fitness center and pool are largely empty right now. Beneath the cranes, I notice rows of tin-roofed shacks where construction workers and their families have set up residence. Laundry billows and smoke rises; children run along the riverside. The juxtaposition makes me laugh out loud. I watch the tattoo of a swallow shiver on my chest. “And where do you fit into this?” I ask myself. As awkward as I feel in the hotel, I remind myself that I am still staying there. It’s an awareness I’d had before, living in the city—that I was, purely by virtue of the passport I held and the language I spoke, immediately upper-class. It doesn’t have much to do with the amount of money in my bank account; it has to do with opportunity. My first week, I’d been casually offered a job that paid per hour more than an average construction worker—the kind whose shacks I’m now gazing at—makes in three days. I might not be a Chinese businessman or a French ambassador, but I still had connections that could land me in the Sofitel. “Did you enjoy your stay?” the receptionist asks as I check out. “It was lovely,” I reply, and I really mean it. I’d taken two hot baths, and eaten the macaroons that had magically appeared at something called turn-down service. I’d watched the BBC while running on the treadmill in the gym, been given a personalized culinary tour of the breakfast buffet by the chef. I’d glimpsed, I felt, into the future of Phnom Penh, the what’s-coming-next of a city I’d come to love. I’d walked the near-deserted halls where the elite’s heels will soon click, and I’d heard my own soles slip beside them. The receptionist hands me my bill in a thick leather check presenter. It’s the moment of truth: I open the check presenter. The Nescafe doesn’t appear on the bill. I smile and thank the receptionist again, letting the bell boy carry my beat-up bag across the lemongrass-scented lobby.